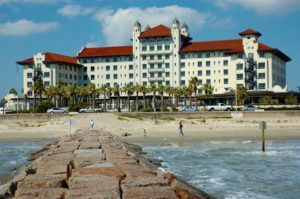 Galveston is a coastal resort city on Galveston Island and Pelican Island in Texas. The community of 209.3 square miles (542 km2) has a little over 50,000 residents. Named after Bernardo de Gálvez y Madrid, Count of Gálvez (born in Macharaviaya, Málaga, Spain), Galveston’s first European settlements on the island were built around 1816 by French pirate Louis-Michel Aury to help the fledgling Republic of Mexico fight Spain. The Galvez Hotel. Photo by anonymous. The Port of Galveston was established in 1825 by the Congress of Mexico following its independence from Spain. The city was the main port for the Texas Navy during the Texas Revolution, when Americans who had been farming and ranching in Mexico decided to take the land for the United States. The trigger for this land theft—which led to the Mexican-American War—was Mexico’s outlawing of slavery (half a century before it was outlawed in the U.S.). For instance, over the past year or so, three vintage tenant homes in Galveston have been relocated and structurally stabilized for further rehabilitation as part of a historic district neighborhood’s ongoing revitalization. These residential reboots are among the latest projects to use seed money from Galveston Historical Foundation’s revolving fund, a long-standing revitalization initiative targeting vacant, under-utilized and endangered historic properties. Revitalization efforts using the GHF revolving fund began in the early ’70s and focused on commercial properties, affecting the city’s Victorian-era business district known as The Strand, now a retail, restaurant and tourism hub. A decade later, residential rehabilitation projects kicked in, and now account for more than 90% of the property overhauls, says Dwayne Jones, GHF executive director and chief executive. 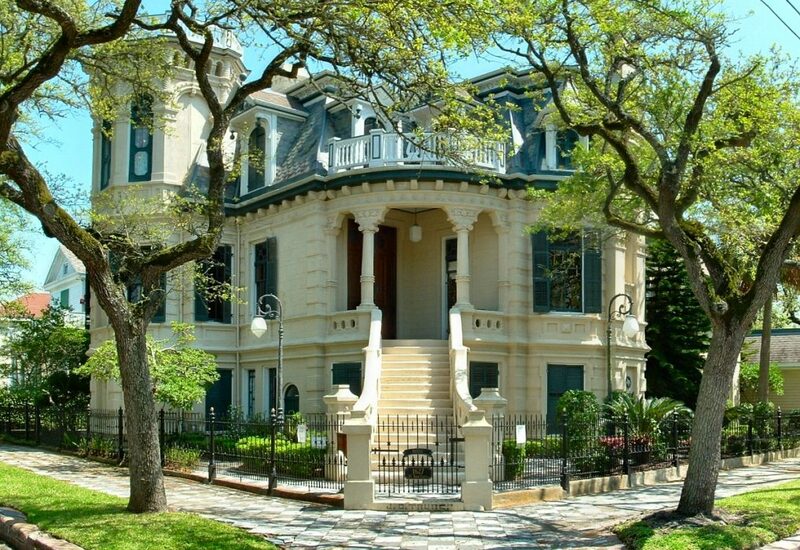 GHF was formed as the Galveston Historical Society in 1871 and merged with a new organization formed in 1954 as a non-profit entity devoted to historic preservation and history in Galveston County. Over the last sixty years, GHF has expanded its mission to encompass community redevelopment, historic preservation advocacy, maritime preservation, coastal resiliency and stewardship of historic properties. GHF embraces a broader vision of history and architecture that encompasses advancements in environmental and natural sciences and their intersection with historic buildings and coastal life, and conceives of history as an engaging story of individual lives and experiences on Galveston Island from the 19th century to the present day. Photo of restored Victorian home (of which there are many) in Galveston is by Nsaum75 via Wikipeia. See article by Cynthia Lescalleet in FORBES.